TALKING TURKEY WITH STEW LEONARD’S! NORWALK, CONN., November 1, 2017 –Stew Leonard’s has been a top Thanksgiving shopping destination for more than forty years. In the week leading up to Thanksgiving Day, the farm fresh food grocer will sell more than 50,000 Thanksgiving turkeys to our customers, which is more than three times the number of turkeys sold during an average week. Our chefs and bakers will also make enough gravy to fill up an entire swimming pool, enough pies to go the length of 97 football fields, and bake a quarter-million dinner rolls. A. Stew Leonard’s offers a range of sizes to meet everyone’s needs! Our turkeys weigh in anywhere between 12lbs to…get ready for this…28lbs! Now that’s a big bird! But I think that having leftovers is just as important as the big meal itself, so I always make sure that we have a bird that allows for 2lbs. per person. If you’re not a fan of leftovers though, I think that 1.5 lbs per person is just fine. Our fresh turkeys can be purchased 10 days in advance, giving you more time to prepare for the big day! A. Once you have your turkey home, it should be stored in the coldest part of your refrigerator, which is the bottom back corner. Keep it wrapped in the plastic until just ready to begin preparing. Our chefs also recommend putting the raw turkey on a plate or in a pan just to make sure no juices accidently drip inside the refrigerator. As the wife of store founder Stew Leonard Sr., Marianne Leonard’s turkey has been the centerpiece of the Leonard family’s Thanksgiving celebrations for two generations. Here, she updates her classic recipe with the addition of Stew Leonard’s aromatics and by using a Naked turkey, free of anti-biotics and added hormones. 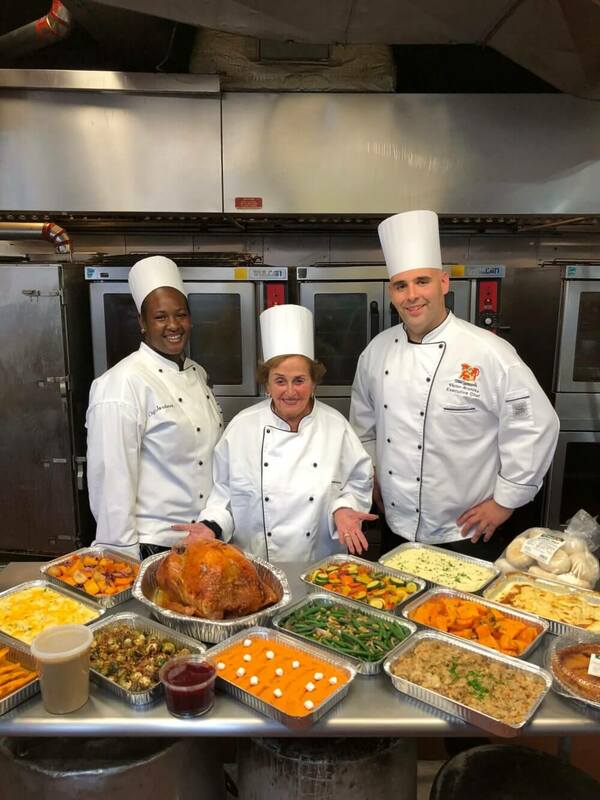 Stew’s Catering teams offer a number of turkey options for Thanksgiving Dinner. For families who want their entire dinner catered from soup to nuts, there’s a Dinner for 8 priced at $150 that includes a medium roasted turkey, country-style stuffing, a choice of two sides, turkey gravy, cranberry orange sauce, snowball rolls, and either an apple or pumpkin pie. For only $50 more, customers can make their Dinner for 8 a WOW with the addition of 2 soups (Lobster Bisque, Butternut Squash or Pumpkin Bisque) and a deluxe salad (Caesar or Capri). Oven ready turkeys are $70 for a large fresh turkey or $50 for a medium fresh turkey from the Shenandoah Valley; for a Naked, free range turkey, price are $90 for a large and $70 for a medium. All oven ready turkeys can additionally be cooked at Stew’s for an additional $30. For smaller gatherings or for extra turkey for your holiday table, Stew’s chefs also offer roasted sliced turkey breast ($70) or sliced boneless turkey thigh ($50). These turkey options are in addition to ten favorite holiday side dishes, freshly prepared by Stew Leonard’s in-house chefs. Perennial home-style favorites, like Idaho Mashed Potatoes, Sweet Potato Mousse, and Brussels Sprouts with Bacon are offered alongside Country Style Stuffing, Maple Bourbon Sweet Potato Wedges, Cauliflower or Potatoes Au Gratin, and other delectable vegetable dishes. Also available is Stew’s homemade Cranberry Orange Sauce, cooked up fresh with real cranberries, white sugar, cinnamon and an orange peel, while the Old-Fashioned Turkey Gravy is made with fresh turkey stock seasoned with fresh herbs and garlic. Customers can round out their dinner orders with ham, lasagna, and appetizer platters all designed to create a memorable and easy holiday feast. For complete Thanksgiving menus, see stewscatering.com to place an order up to one week in advance of Thanksgiving. Stew Leonard’s is open on Thanksgiving Day, Thursday, November 23. From a broken oven to a turkey that’s been nibbled on by Fido or Fluffy, our chefs are here to help with any turkey emergencies that day! Stew Leonard’s, a family-owned and operated fresh food store founded in 1969, has stores in Norwalk, Danbury, and Newington, Conn. and in East Meadow, Farmingdale and Yonkers, N.Y. Stew’s earned its nickname, the “Disneyland of Dairy Stores” because of its country-fair atmosphere, with costumed characters and animated entertainment throughout the store that keep children entertained while parents shop. Stew Leonard’s legion of loyal shoppers is largely due to the stores’ passionate approach to customer service: “Rule #1 — The Customer is Always Right”; Rule #2 – If the Customer is Ever Wrong, Re-Read Rule #1.” This principle is so essential to the foundation of the company that it is etched in a three-ton granite rock at each store’s entrance. The company’s culture is built around an acronym for S.T.E.W. : Satisfy the customer; Teamwork gets it done; Excellence makes it better; WOW makes it fun. For more information, visit Stew Leonard’s website at www.stewleonards.com.